I’m a little behind on my blogging. Doh! Here is what we did for our last theme unit on germs and dental health. 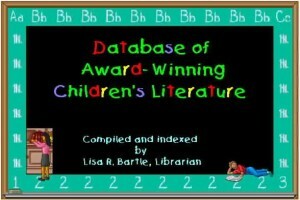 Here is our book list. I also found a couple of good videos. Sesame Street’s Healthy Teeth, Healthy Me is perfect for preschool age. I also found a Magic School Bus episode on Netflix that explained how germs make us sick – I believe it was Inside Ralphie. Crazy how those videos have been around so long – I remember that episode from when I was a kid! We did a really cool science experiment this week. We placed eggs in different liquids in jars overnight to see how the liquids would each affect the egg shell. First I explained to Curly that egg shells are similar to our teeth, so the same thing would happen to our teeth that happened to the egg shell. We did five different liquids – water (as the control), orange juice, white vinegar, apple cider vinegar, and coca cola. In the above picture there are only four, but I added the apple cider vinegar jar later as an afterthought. You will notice the eggs are brown – I didn’t have any white eggs in the house and I figured the experiment would work just as well with the brown ones. We labeled each jar, and wrote down what time it was when the eggs were placed in their jars. 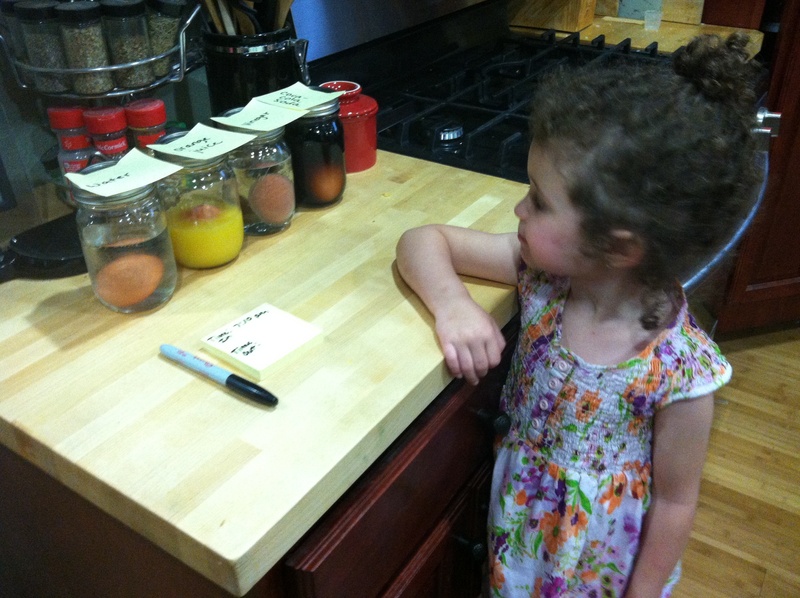 I attempted to hypothesize with Curly – What do you think will happen to the eggs? 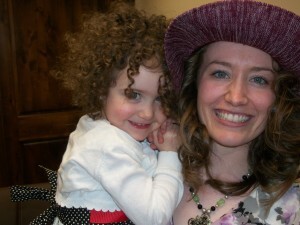 She was very excited and just repeated that she didn’t know. So, we just said we will have to see in the morning. 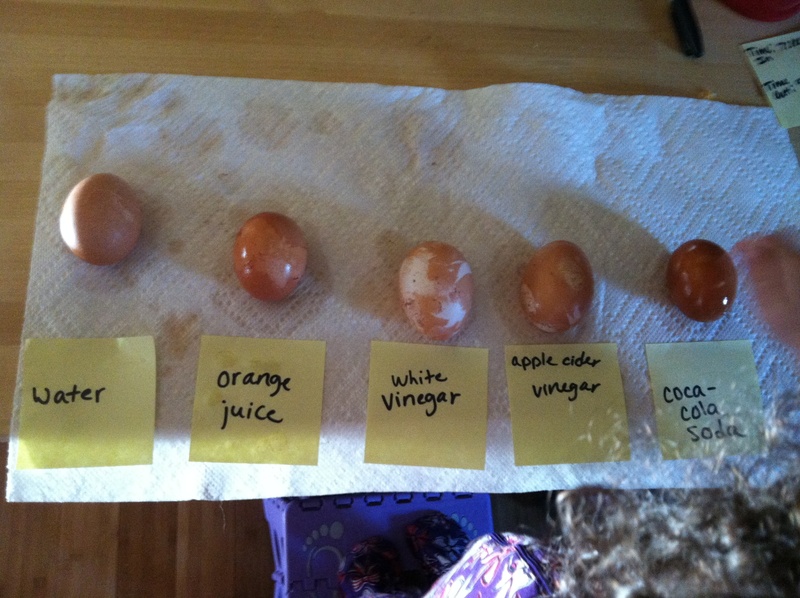 I was a bit excited to try this experiment just to see the vinegar-soaked eggs. I have seen pictures on Pinterest and it looked pretty cool! The end result. Since the eggs are brown the effect wasn’t as drastic as with white eggs, but the vinegar eggs were squishy (the white vinegar worked a tiny bit better that way)…and bouncy. We bounced them on a cookie sheet. The egg soaked in orange juice looked like some of the egg had been eaten away but it wasn’t too bad. 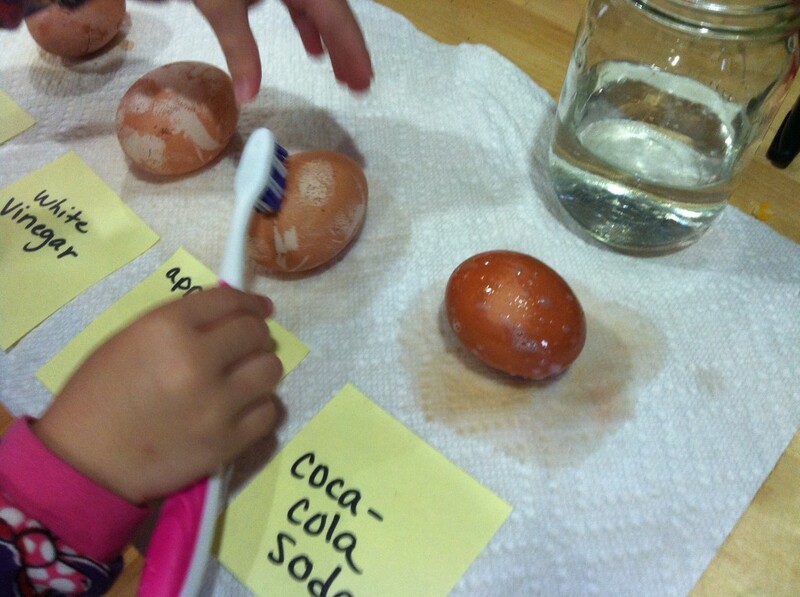 The egg soaked in coke was dark brown. Of course, the one soaked in water was completely normal. The next course of action was to see if we could repair any of the eggs with toothpaste. The only one that we were able to make a difference on was the coca cola egg- we brushed off quite a bit of the brown but it was still stained. Overall, we had a lot of fun doing this experiment! For art we did some toothbrush painting. 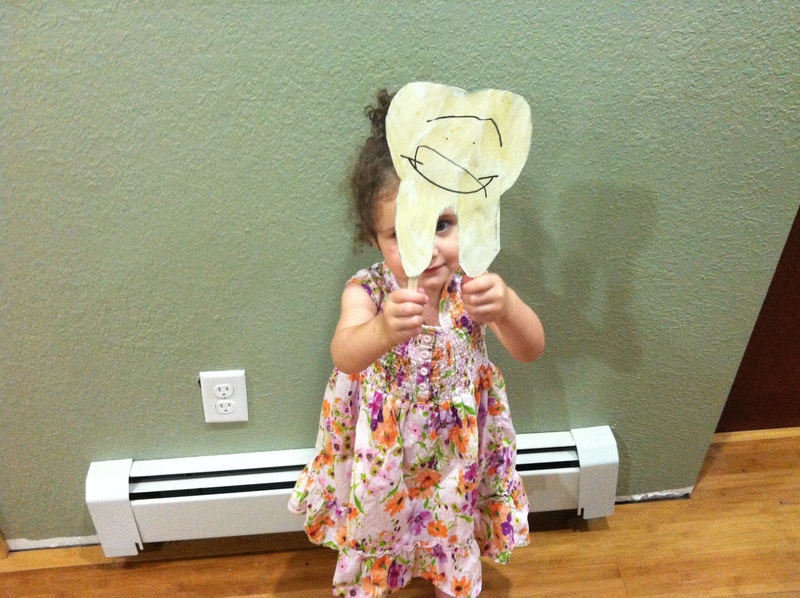 I cut out a tooth shape out of yellow construction paper and had her ‘scrub’ the tooth with white paint. After it dried the yellow paper still showed through a bit but she was satisfied. Then she drew a ‘face’ on it and I helped her glue popsicle sticks to it for handles. It became a yellowish tooth puppet. Oh joy! For math we did a few different things, like counting our teeth and sorting poms poms. 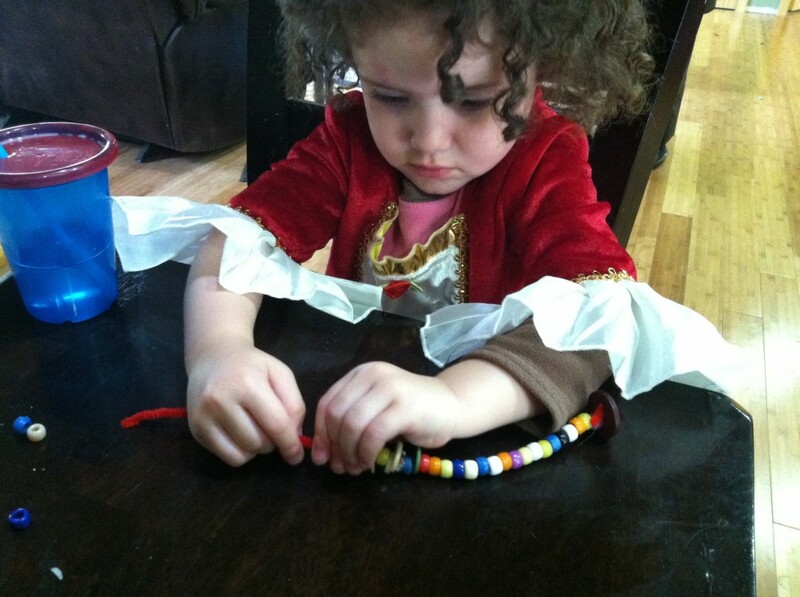 For a fun fine motor activity she strung beads and buttons on a pipe cleaner to make a ‘snake’. This is one we have done before. She enjoyed it much more this time. It kept her busy for a long time. Notice the all-important princess dress up clothes. Hey, as long as she recognizes that that means I’m the queen. We have a fun little game from Smartgames called Day And Night that she pulled out. Smartgames produces toys and games for toddlers/preschoolers that are supposed to promote problem solving and logical thinking. 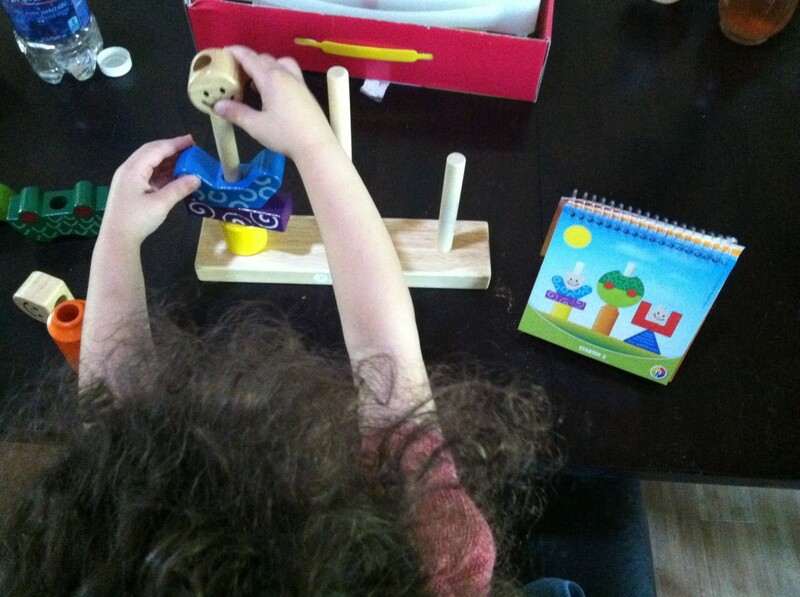 I really like how they use wood and not plastic in their toys. I’m not sure what the actual difference it makes, but it’s just nicer for whatever reason. The game works like this: It comes with a little booklet of several pictures of blocks arranged in different ways on wooden pegs, which you try to copy. You help your child at first until they understand the concept. As they figure out one picture without help, they progress to the next. Eventually the pictures are just dark shapes, and you try to figure out the correct placement of the pieces just by the shapes. I appreciated how it really did require Curly to think about what she was doing. A simple and very effective little game!